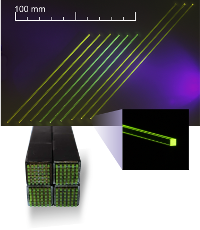 Linear and two-dimensional scintillation arrays assembled in Crytur are based on proprietary single crystal materials and provide position sensitivity in scanning, imaging and highly specialized research applications. Crytur delivers highly highly-specialized detection arayss and bars for position sensitive detection. 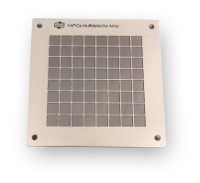 The size of detection elements ranges from several tenths of mm up to several mm depending on the scintillation material and on the design of the array. Our special production technology enables very compact designs with distance between pixels of less then 0.050 mm. The minimum pixel size is 0.3 mm x 0.3 mm.